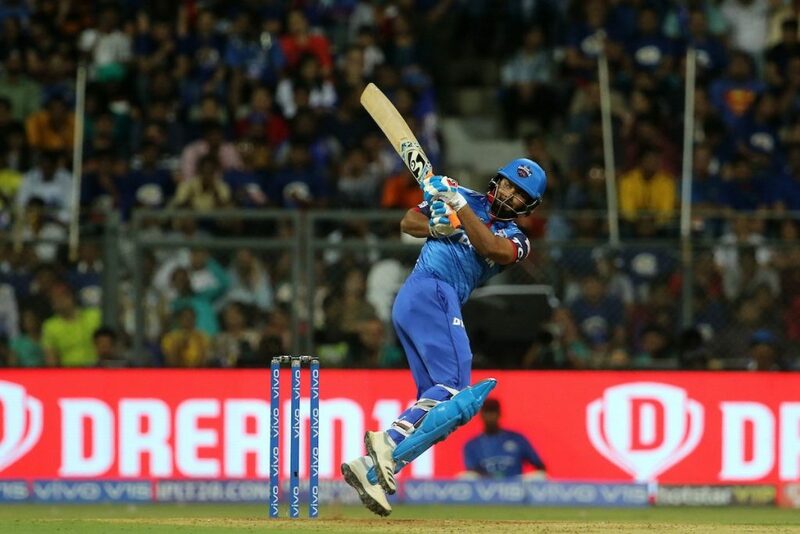 Rishabh Pant scored a sensational 78, as Delhi Capitals started their IPL campaign with a 37 run victory over Mumbai Indians at Wankhede Stadium on Sunday. Mumbai Indians skipper Rohit Sharma’s decision to field first was vindicated as his bowlers started off superbly as Mitch McClenaghan snared Prithvi Shaw and Delhi skipper Shreyas Iyer inside the first four overs for 7 & 16 respectively. The pair of Shikhar Dhawan and Colin Ingram steadied the ship and pulled the visitors out of the trouble with their 83 run stand for the third wicket, before Ben Cutting gave Mumbai the much needed breakthrough by claiming the latter, who was caught by Hardik Pandya for a well made 47. Dhawan also departed soon, as Delhi from 112 for two slumped to 131 for four. The young dashing wicket keeper was in a destructive mood, as he took on Hardik Pandya for two sixes and a four in the 16th over. He was also severe on debutant Rasikh Salam as he smashed two sixes and a four in the penultimate over. Pant’s knock comprised of 7 fours and 7 sixes. Delhi in their last 6 overs scored 99 runs, as they posted a mammoth 213 runs in their allotted 20 overs. McClenaghan was Mumbai’s best bowler as he ended up with figures of 3/40, while Bumrah, Hardik and Cutting claimed a wicket each. Chasing a target of 213, the opening pair of Rohit Sharma and Quinton De Kock started steadily by adding 37 runs for the opening stand, before the former was dismissed by Ishant Sharma for 14. Shreyas Iyer ran out Suryakumar Yadav with a direct hit for 2 runs, and Ishant bagged the former for 27 in the same over to leave the home side in trouble at 45/3. New signing Yuvraj Singh and Kieron Pollard put on 50 runs for the fourth wicket stand, before Keemo Paul claimed the prize scalp of Pollard for 21. Axar Patel in the 12th over bagged the 25 year old Hardik Pandya for a second ball duck. Senior batsman Yuvraj Singh and Krunal Pandya kept the home side in hunt by putting on 39 runs for the sixth wicket, before the latter fell to Trent Boult for a brisk knock of 32. The 37 year old left handed batsman kept in the Mumbai Indians in hunt with top score of 53 runs, but wickets continued to tumble frequently, as the home side were folded for 176 runs in 19.2 overs. Ishant Sharma and Kagiso Rabada claimed two wickets each for Delhi Capitals. Rishabh Pant was declared the Player of the Match for his quickfire knock. The third match of the Indian Premier League will be played between Rajasthan Royals and Kings XI Punjab at Jaipur on Monday.